How do you spell ZnS? Our favorite minerals come in many forms and colors and it is fun to collect the variety that is available. But did you ever stop to think how many different spellings there are for your favorite mineral in all the world’s languages? 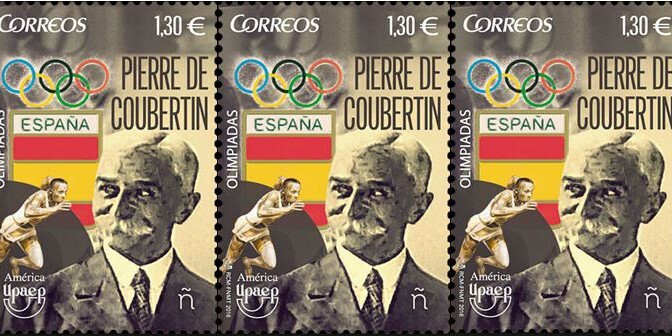 One way to get started on such an investigation is through worldwide postage stamps. Here is an example using the important sulfide mineral from which most of the world’s zinc is resourced. There are certainly more languages than represented by these stamps from 12 countries and ten languages, but they do cover the world! In the late 19th century, building technology and urban development led to taller multistory buildings. Office and apartment buildings grew vertically. Naturally this led to new opportunities for creativity and invention and the Post Office Department was looking for improved methods to collect and move the mail from these buildings. The idea of creating mail chutes to optimize the collection of outgoing mail from the taller buildings sounds like a simple innovative solution that should have occurred as soon as tall buildings were built. 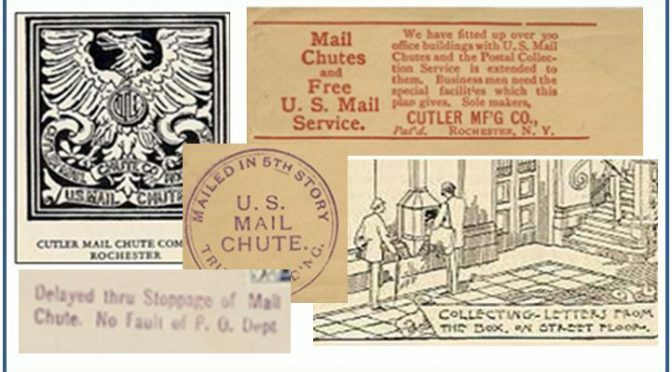 But it took until 1883 for the mail chute to be invented and the first installation was right here in Rochester, New York. 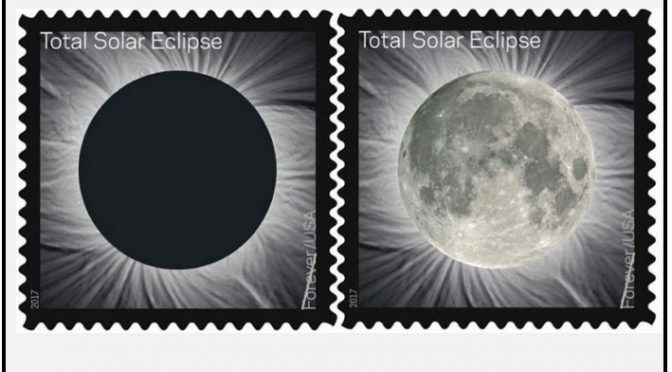 On August 21, the sun will disappear for more than 2 minutes across a wide swath of the nation and the USPS is not missing out on the action. 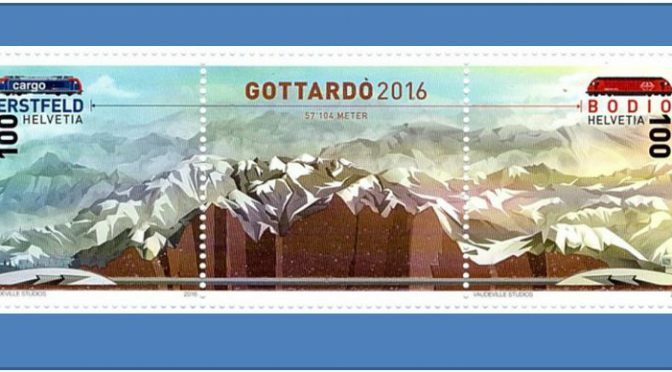 A month prior to the eclipse and aligned with the summer solstice, a single Forever stamp will be issued to commemorate the event. The first day of issue will be in Laramie, Wyoming on June 20th. As many of my friends know, I collect stamps as well as minerals and I enjoy thematic, or so called topical stamp collecting. Naturally, my career in geology and my interest in minerals draws me to topics related to those categories. But I also enjoy hearing how others merge their interests with other topics with the joy of philately. To most of us they are lady slippers or simply orchids. But to Paul Brach they are called Cypripedium orchids. A specific genus or orchids of which there are 58 species, each with their own color, petal shape, stamen, and sepal design. 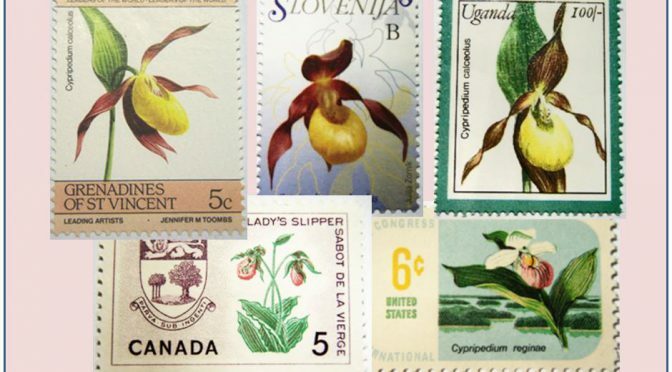 At the March 9th meeting of the Rochester Philatelic Association, Paul described all the features of these gorgeous flowers using the multitude of world-wide stamps that have been issued featuring Cypripedium orchids. In addition to demonstrating his knowledge of these colorful orchids, Paul showed us his photographic prowess at capturing them on film. My favorite rock hound club (Wayne County Gem and Mineral Club) loves to dig and we are always looking for new places to dig and new tools to use while digging. But there are some folks in Switzerland that we must acknowledge have done a little more digging than us while deploying more sophisticated and larger tools. In fact, they have been digging on the same project for 17 years. And in June of 2016 they completed their mission. All they had done was dig a 57 km (35 mile) railway tunnel through the Alps in south-central Switzerland: the Gotthard Base Tunnel. All told this massive project removed 28 million tons of igneous and metamorphic rock (dominantly gneiss). That is enough rock to build a rectangular regular pyramid that is 5200’ high. Think about that! At its deepest points the Alps tower more than 2000m (6500’) above the tunnel floor. 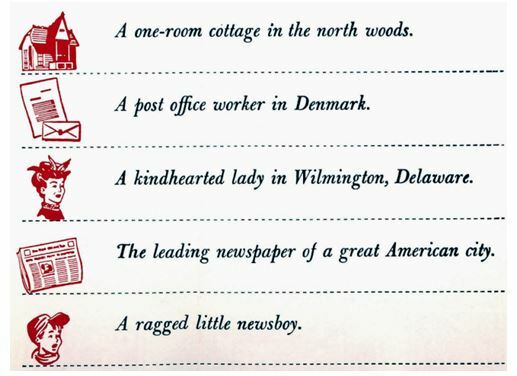 A fellow member of the Rochester Philatelic Association likes to stimulate her Facebook friends by placing a theme word or phrase onto her Facebook Timeline each day and having her friends post philatelic responses. Well, one day in late January her theme was simply “my town”. I decided to seek out postmarks from the many locations I have lived. Naturally, I started with my hometown of East Longmeadow, MA. I opened Google Image Search and simply typed: “East Longmeadow postmark”. I was rewarded with a page of image snippets some of which actually met my intended search criteria. About two rows down in the middle of the screen I saw this excellent and legible postmark atop the five cent 1964 John F. Kennedy stamp. I hit enter. Rochester Philatelic Association club member Paul Brach likes mushrooms. If you are roaming a Monroe County Park you might spot Paul and his camera searching the forests and meadows for the biggest, the best, or the rarest fungi to photograph. 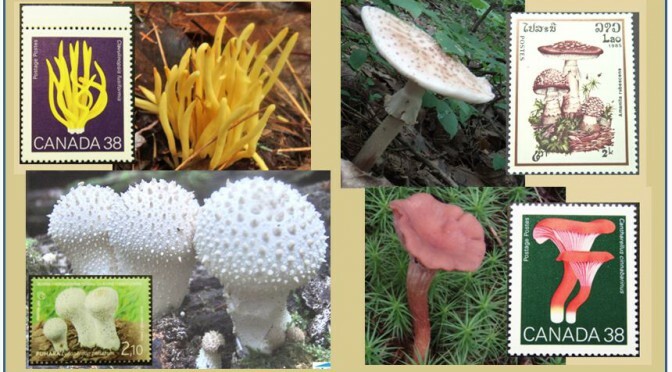 Like many of us with a “second” hobby, Paul augments his field and scientific interest in mushrooms by collecting them on stamps. Paul shared his love of mushrooms with RPA members at our March 10th meeting. A Maximum Card (often referred to as a maxicard) is a philatelic postcard with a postage stamp placed on the picture side of the card. The stamp and card match or in some way relate to each other. Maxicards are officially released by many of the world’s postal services, but they are also generated personally by individuals combining a stamp issue with a simple souvenir postcard. In most cases, the cancellation is also related to the image on the front of the card and the stamp. As a collector of minerals, mining and geology on stamps South Africa’s 1984 four-stamp set commemorating some of the country’s strategic resources was a fine add to my collection. It was not until a couple of years ago, however, that I learned that the officially released Maximum Cards S10-S13 for these stamps featured geologic maps. 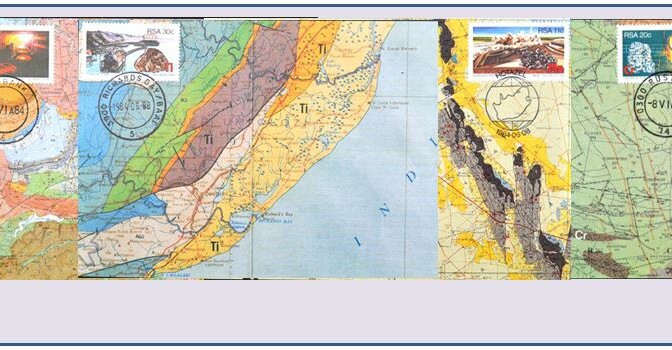 Not only would this satisfy another of my topical interests (maps on stamps), but as a retired geologist I found the inclusion of geologic maps on the “Maxicards” most interesting. Thanks to a tip provided by a fellow member of The CartoPhilatelic Society on the club’s shared discussion site, I was able to purchase a complete set via an online source. 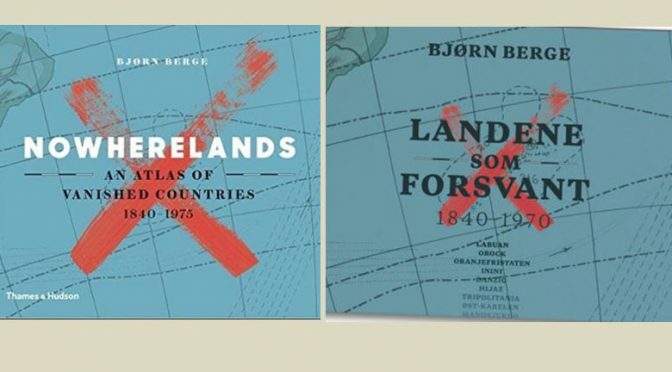 Now it seemed only fitting that I research the stamps and maps a bit. This note will be constructed to accommodate both Philagems and The New CartoPhilatelist, newsletter of the Maps on Stamps Study Units, as the cards are equally collectible for members of both ATA study units. 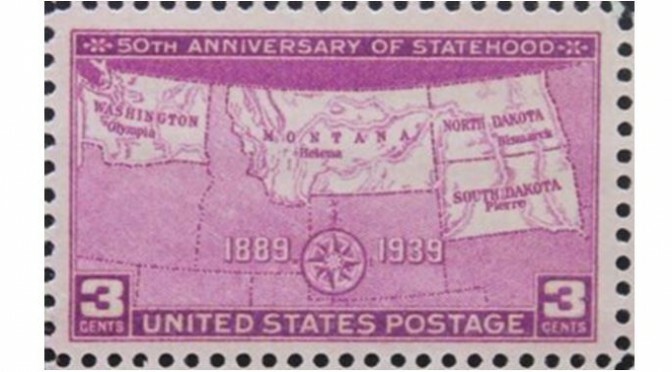 When Rochester Philatelic Association member Gail Ellsworth was looking over her dad’s stamp collection she happened upon an old newspaper article discussing a creative use of the 1939 50th Anniversary of Statehood Commemorative Issue for four northwest states. Over the course of the past couple decades, RPA Club member Steve Eisinger has assembled a rather interesting collection. He collects stamps together with coins from tiny countries and enclaves around the world. He keeps the stamps and coins together and organized geographically. 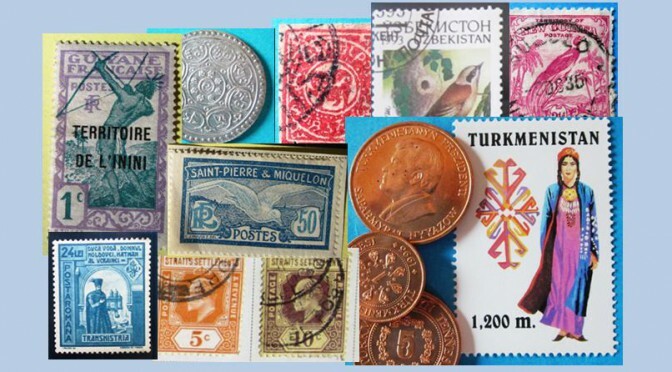 In October, Steve shared his collection with us with a presentation entitled “Confusing, Obscure, Bizarre, and Defunct Countries – Their Coins and Stamps”. Late last spring the Rochester Philatelic Association collected birthday information from its members. No, the data has not been turned over to the NSA, the IRS, or even the APS, and your birthdays have not been, and will not be, posted on Facebook! Rather, we thought it might be interesting to evaluate the demographics of stamp collectors. Granted, we are a small club, and a regional one to boot, but there seems no reason to think that our little enclave of philatelic enthusiasts should be radically different from the overall population of collectors, or at least collectors who opt to join clubs. So what did we learn? The average age of the 88 members for which we obtained data (which was virtually everyone), was 70.7 years as of June, 2015. A whopping 28 members, or almost one third of us, are over 75 years of age. 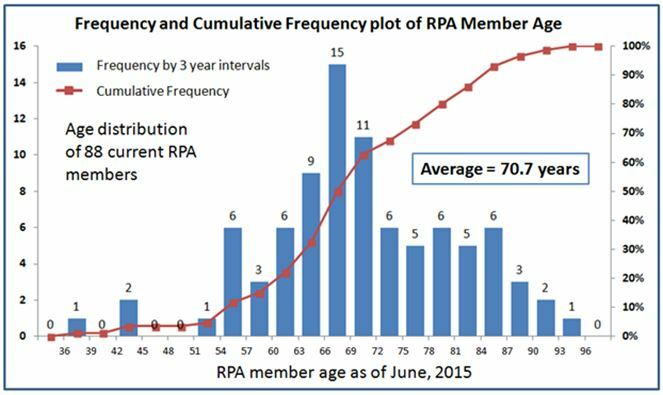 When portrayed in frequency format using 3 year increments, the modal population is 66-69 years old. Our youngest member is 37 and she (note that pronoun, but that is a different demographic issue) just joined us this year. We have/had only 3 members less than 51 years of age. One just moved to South Carolina. Ouch! So those are facts, but what might this tell us, if anything? Well, at first glance one might surmise that we are simply an aging group, destined to a slow but steady decline as the years and decades pass. But one could argue that it might be more complicated than that. Perhaps the fact that almost 40% of our members are between the ages of 63-72 just reflects the fact that folks turn to philately at/or near retirement. Or that stamp collectors who are younger haven’t the time, or motivation, to join clubs such as ours until they retire. Either way, it might be this demographic group (retirees or those approaching such) that the hobby, and clubs like ours, should target rather than thinking it can make significant inroads on attracting the 30 or 40 somethings who are busy working and raising families. Of course, these are just my thoughts from an interesting data set. In the WCGMC March 2015 Newsletter, Fred Haynes introduced a method of collecting minerals and gems in the winter when the ground was covered knee-deep in the white stuff. Simply they can be acquired by collecting postage stamps. Fossil hunters shall not be left behind! Fossils are also depicted on many postage stamps. In fact, the American Topical Association (ATA) lists more stamps with fossils than minerals. The ATA recognizes 3535 stamps from around the world depicting fossils ranging from diminutive invertebrates to enormous dinosaurs. 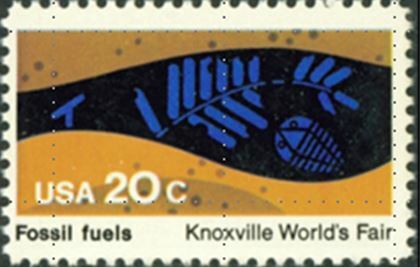 In 1982, the US commemorated fossil fuels with a stamp that included both a Carboniferous fern and a trilobite. It is the middle of February in upstate New York and the weather outside is not particularly conducive to mineral and fossil digs. Yes, I can plan, and I am. Yes, I can clean and organize last year’s bounty, and I try to make time for that, but even the rocks in the garden remain covered and out of reach. BUT, there is another way to collect minerals in the winter and I keep busy doing just that when the spirit moves. They can be collected on postage stamps. 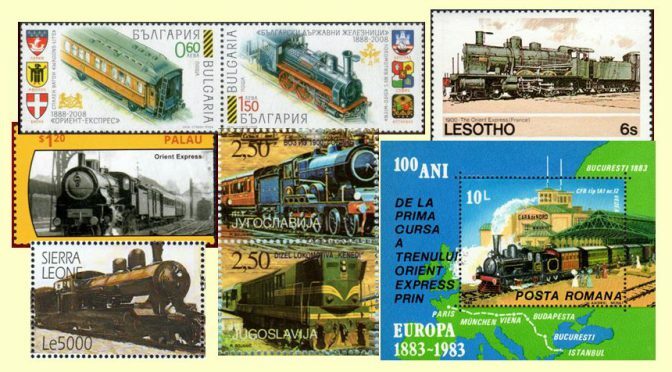 Did you know that there is an international organization of folks who collect gems and minerals on postage stamps? They call themselves the Gems, Minerals and Jewelry Study Unit (GMJSU) and they are one of 52 active affiliate organizations of the American Topical Association (ATA), a philatelic organization with almost 3000 thematic stamp collectors worldwide. 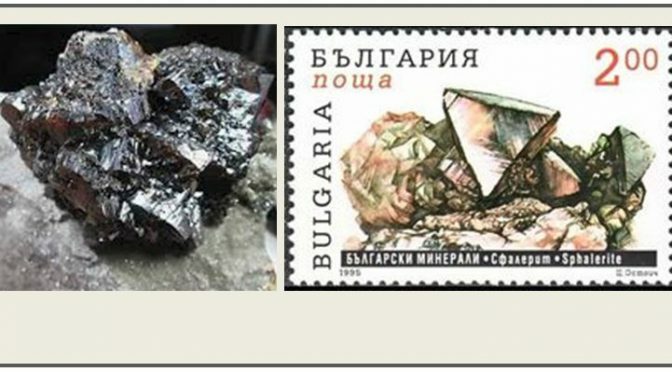 The GMJSU publishes a quarterly newsletter called Philagems International and maintains an Excel spreadsheet listing all stamps depicting minerals, gems, and mining. At last count there are over 2700 individual listings although many reflect sets of stamps so the list of actual stamps is larger. 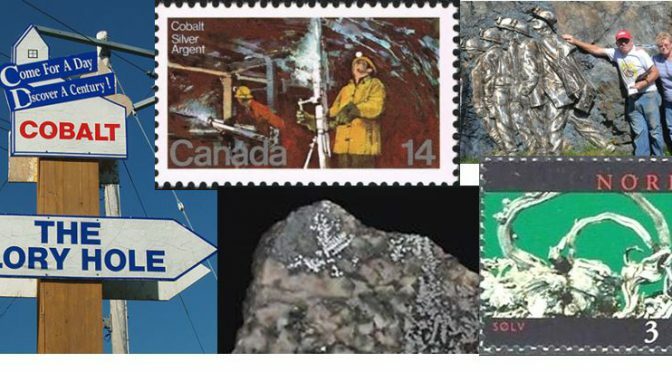 Of those listings, over 1500 are identified as strictly mineral stamps and over 400 as gem stamps. Over 90 countries are represented on the list. Rochester Philatelic Association member Florence Wright opened the first RPA meeting of 2015 by asking the 28 in attendance if they knew what these five items had in common. Of course, we knew the title of her talk so it was a bit of a rhetorical inquiry, but we all learned a lot in the next 40 minutes as Florence explained the 108 year history of Christmas Seals. The picture above is the Hope Diamond, which was recently acquired by the Rochester Philatelic Association. OK, that second part is fiction, but there are two bits of interesting philatelic news related to this famous gem. Did you know that the Smithsonian Institute obtained the Hope Diamond in November of 1958 when New York City jeweler Harry Winston donated the famous gem. He hoped the donation would stimulate further donations and lead to a world quality gem exhibit. It did. You knew all that? OK, but do you know how the stone was sent from New York to Washington D.C.? 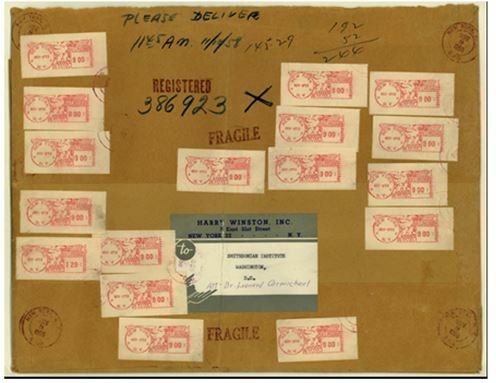 Turns out Mr. Winston wrapped the stone in brown paper and shipped one of the world’s most famous and valuable gemstones via USPS registered mail. The shipment, with insurance, cost him $145.29, of which only $2.44 was for postage. The Hope Diamond was then valued at 1 million dollars. Below is the envelope used with the meters and auxiliary markings. 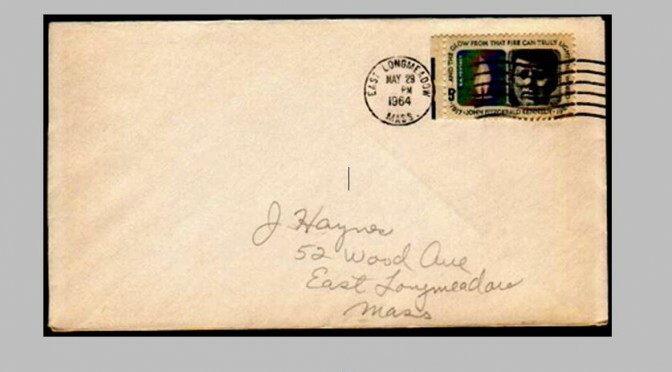 This remarkable Auxiliary Marking envelope is now on display at the National Postal Museum in DC. This is a two part post reporting the results of two Rochester Philatelic Association meetings in early 2014. 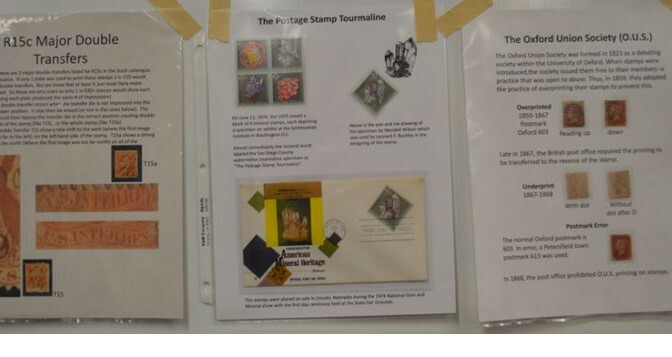 It is a New Year and the Rochester Philatelic Association ushered it in on January 9th by learning a bit about the art of exhibiting. Past president, and ROPEX chairman Tom Fortunato described the basics of exhibiting to a audience of 28 members.